Once again Char-Broil has produced another gas grill with a charcoal pan insert. Promising the best of both worlds, this model can be quickly converted into a gas or a charcoal grill by use of a specially designed coal pan that fits directly over the gas burners. The whole point of this grill is that when you want it to be a gas grill it is, and when you want it to be a charcoal grill, you put in the special charcoal pan, fire up the gas burners to light the charcoal and in about 15 minutes it's ready to cook. The problem and advantage of this grill is that it is inexpensive. which is good because it is, well, inexpensive, but bad because it is inexpensively made, meaning it is rather cheap. Back in 2004 Char-Broil offered the Easy Charcoal/Gas Grill Hybrid grill. 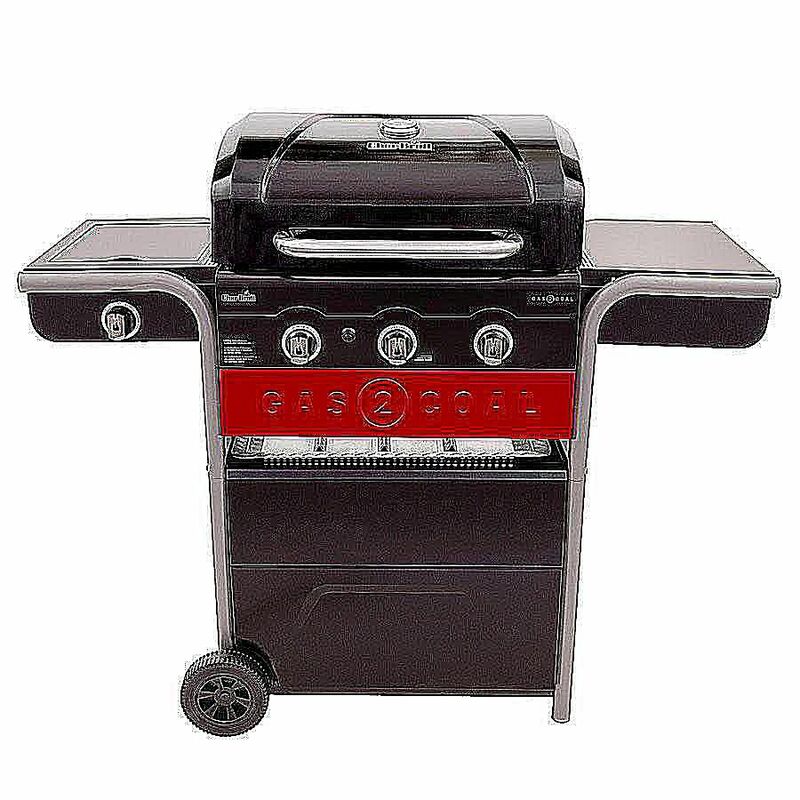 Basically, that grill, like this one was a standard gas grill with a special drop in charcoal pan, a technology they had bought from its inventor many years earlier. The idea is that the main burners can be used to light the charcoal, giving the user the option of using it as either a gas or charcoal grill. While the idea is sound and it is used in a number of higher end grills with success, this idea has problems, mostly because the thing that makes a great gas grill (which this one isn't) is exactly the thing that makes a bad charcoal grill. The Gas2Coal is the latest version of this idea for Char-Broil and they have actually attempted to make a few improvements. Originally, the charcoal pan, used in this style of grill was basically a deep dish cookie sheet. There was not airflow and the charcoal was ignited by getting really hot sitting over the gas burners. Now, this pan is actually functional, at least it looks that way. There are a couple of rows of vents to air can actually travel through the grill and help get the charcoal burning better. The coals don't sit over the vents to airflow is limited. This prevents the coals, which sit directly under the porcelain coated cast iron cooking grates from getting out of control, so heat is held down from ridiculous and the charcoal doesn't burn out too quickly. Another great innovation for this model is that there is an actual place to put the charcoal pan when you are not using it, directly under the firebox on its own little shelf. This makes storage actually possible and the pan is easily accessed. Aside from this feature, the charcoal cooking part that is, this is in reality, a basic three burner gas grill with a 12,000 BTU side burner. As a gas grill, the heat output is good, good enough to do some real grilling, which, of course, is something many modern gas grills seem to have trouble doing. Ultimately, this grill isn't about its quality, or lack thereof, of how it performs as a gas grill, which is pretty good for the price, but what it is and how people view it. This is sold as the perfect solution to the person looking for the "best of both grilling worlds", to quote the literature. What it really lacks is the versatility and joy that is charcoal grilling. Yes, you can fire up the coals and throw a couple of steaks on there and they will turn out better than they would over the gas burners, but the evenness of heat and the control of that heat is sorely lacking. The problem is, in the final line of this review, that as a charcoal grill, it isn't very fun to use.